All Hamilton Square homes currently listed for sale in Hamilton Square as of 04/20/2019 are shown below. You can change the search criteria at any time by pressing the 'Change Search' button below. If you have any questions or you would like more information about any Hamilton Square homes for sale or other Hamilton Square real estate, please contact us and one of our knowledgeable Hamilton Square REALTORS® would be pleased to assist you. "Welcome to 3324 Nottingham Way. This Stunning Home combines Yesterday's Charm with Today's Modern Convenience's. Beautifully Maintained and Updated and Featuring: Gleaming Hardwood Flooring, Original Wood Moldings and Arched Doorways; Lovely Light-Filled Enclosed Porch with Heat; Inviting Foyer with Period Staircase; Charming Formal Living Room accentuated with the original Carved Brick Fireplace; Elegant Formal Dining Room; Gourmet Kitchen with Granite Countertops, Commercial Stove, Exhaust Hood, Copper Backsplash, Breakfast Counter and Built-In Desk; Spacious Family Room with Ceramic Tile Flooring; a First Floor Master Bedroom with Huge Walk-In Closet and En-Suite Bathroom; a Convenient Powder Room and Laundry Room complete the Main Floor. Upstairs Boasts Four More Well-Appointed, Sunny Bedrooms and a Full Hallway Bathroom. Full Basement with Bilco Doors. Gorgeous Backyard with Sweeping Lawns and Mature Trees ? The Perfect Spot for Relaxing, Entertaining or Playing. Great Location close to Major Highways and Train Station, and a short walk to Shopping and Restaurants. Steinert School District! Two Year Home Warranty Included!" "Significant Price Reduction! 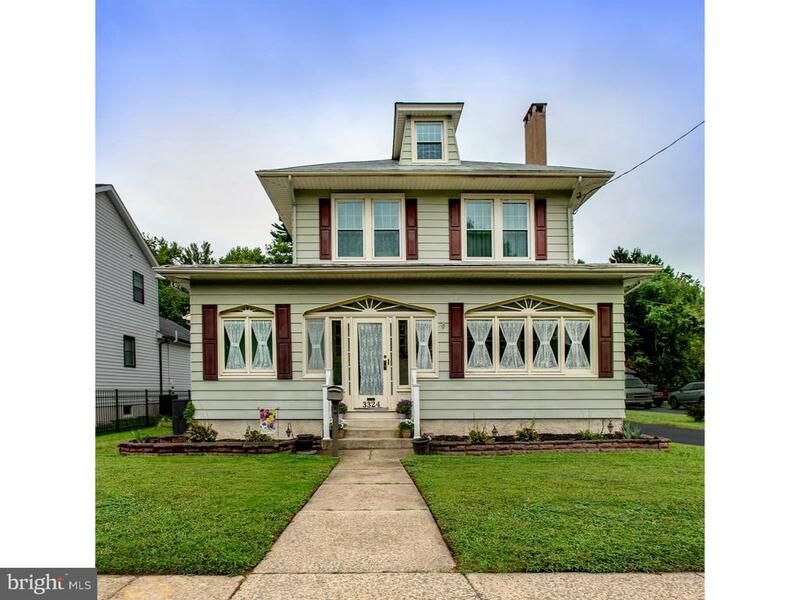 Beautiful Hamilton Square colonial extensively rehabbed in 2006. New plumbing, electrical, floors, walls, insulation, siding, doors, windows, you name it! Walk up the entryway to the charming front porch with a sitting area and watch the world go by. Enter the home through the beautiful front door with sidelights into the foyer with hardwood floors that extend into the spacious living room. Enjoy meals in the gracious dining room with ceramic tiles that lead into the roomy kitchen with cherry cabinets, ceramic backsplash, double stainless sink, breakfast bar and access to the rear yard. An additional room on this level is currently used as a bedroom which has sliders leading out to the back yard. Upstairs the hardwood floors continue from the hallway into the two bedrooms; a roomy master bedroom with double closets, and a second bedroom with an additional ante-room currently set up as an additional bedroom. The bathroom has been updated with a new vanity, vanity and bathtub. The dry and spacious partially finished basement offers additional living space as well as laundry facilities. Step out back into your own private oasis with a brand new wood fence, Envision yourself enjoying the vibrant lawn and gorgeous flowers. In the back there is a spacious shed for all your outside storage needs. 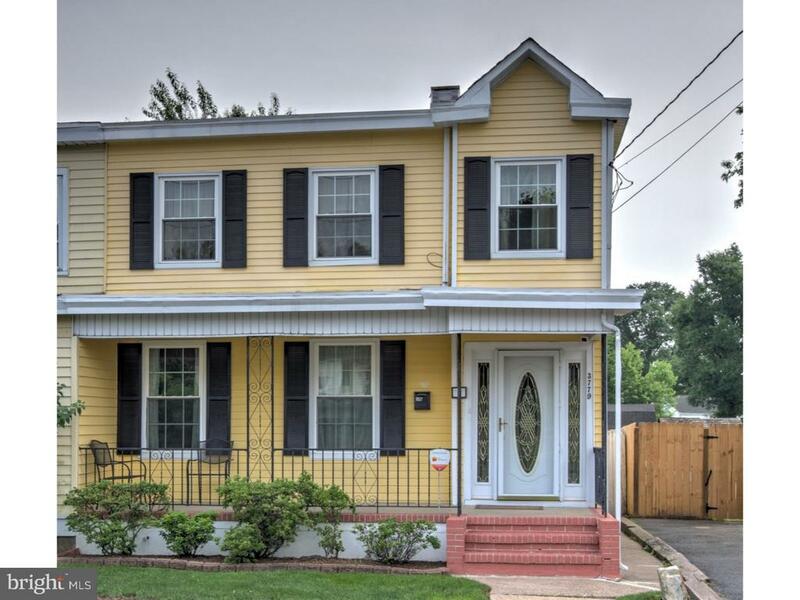 Enjoy the historic charm of Hamilton Square and the convenient location to shopping centers and routes 33, 130, I-195, I-295 and NJ Turnpike."